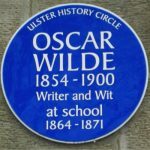 Oscar Fingal O’Flahertie Wills Wilde was born in Dublin on 16 October 1854. His father, Sir William Wilde, was an eminent Dublin surgeon and his mother, Jane Francesca Elgee, agitated for Irish Independence and wrote revolutionary poems under the pseudonym “Speranza”. 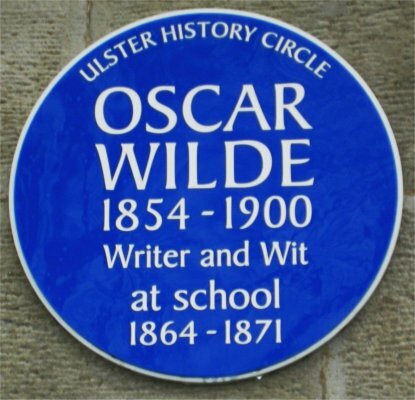 In 1864 Wilde went to the Portora Royal School where he excelled in the classics, taking top prizes. He was awarded the Royal School Scholarship to Trinity College in Dublin where he earned a Foundation Scholarship. In 1874, he won the college’s Berkeley Gold Medal for Greek and was awarded a Demyship scholarship to Magdalen College in Oxford. There Wilde was awarded the Newdigate prize for his poem, Ravenna, and a First Class in both his “Mods” and “Greats. After graduation, he moved to London. In 1881, he published his first collection of poetry, Poems, which received mixed reviews by critics. In 1881 and 1882 Wilde travelled across the United States giving over 140 lectures in 260 days. He spent the next couple of years in Britain and France, championing ‘Art Nouveau’-essentially the Aesthetic, art for art’s sake movement. In 1884, he married Constance Lloyd. They had two sons, Cyril in 1885 and Vyvyan in 1886. He worked on The Woman’s World magazine in 1887-1889. In the following six years he published two collections of childrens stories, The Happy Prince And Other Tales (1888), and The House Of Pomegranates (1892). His first and only novel, The Picture of Dorian Gray, was considered very immoral by the Victorians. The first of his witty and scandalous plays, Lady Windermere’s Fan, opened in February 1892 to critical acclaim. His subsequent plays included A Woman Of No Importance (1893), An Ideal Husband. (1895), and The Importance Of Being Earnest (1895). His friendship with Lord Alfred ‘Bosie’ Douglas, the third son of the Marquis of Queensberry, was to prove his undoing. In 1895, Wilde sued Bosie’s father for libel as the Marquis had accused him of homosexuality. Although he withdrew the case he was himself arrested, convicted of gross indecency and sentenced to two years hard labour. His long, poignant and revealing letter, now known as De Profundus, written from prison to Alfred Douglas, was not published in full until 1962. On his release, he wrote The Ballad of Reading Gaol, a response to the agony he experienced in prison. He spent the last three years of his life wandering Europe. He died of meningitis on November 30, 1900 and was buried in Bagneux. His remains were later transferred to the National Cemetery of Pere Lachaise in Paris, where, on the back of the ornate Epstein Tomb, is carved part of a verse from his last work. Location of plaque: Portora Royal School, Enniskillen.